Founder and Chair of the European Parliament’s Fairtrade Working Group, Linda McAvan MEP, is supporting Fairtrade Fortnight (29 February – 13 March) across Yorkshire and the Humber. The campaign covers two weeks of activity demonstrating how buying Fairtrade products can improve the lives of people in the developing world. 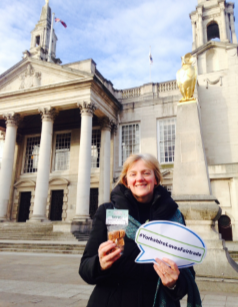 Linda will launch the #YorkshireLovesFairtrade social media campaign which encourages Fairtrade supporters across the region to send in pictures of themselves at iconic Yorkshire locations with Fairtrade products via Linda’s Facebook and Twitter. Linda said “The #YorkshireLovesFairtrade campaign is a fun and simple way for everyone to get involved and show their support for Fairtrade. Fairtrade means farmers in developing countries get a fairer price for their crops and can sustain their livelihood through trade rather than aid”. Yorkshire is one of the most active Fairtrade regions in the country. Fairtrade Yorkshire has come a long way since it was launched in 2011. To date there are 39 Fairtrade towns, cities and villages across the region and an ever increasing number of businesses, schools and universities signing up to Fairtrade.